SSC CGL Admit Card 2018: The Staff Selection Commission conducts the Combined Graduate Level Exam for the recruitment of Grade “B” and Grade “C” category posts in various Government Ministries, Departments, and Offices. SSC CGL Admit Card will be issued son on the official website of conducting authority i.e. ssc.nic.in. Every aspirant who registered for SSC CGL Exam 2018 will be issued an e-admit card/hall ticket. To download SSC CGL Admit Card, visit the official website and enter your registration number/date of birth in the given fields. SSC CGL Admit Card will have details of the examination such as Date of Examination, Roll Number, Code of Centre, Examination Centre, Photograph, and Signature. Candidates must bring the SSC CGL Admit Card to the Examination hall; without hall ticket, candidates will not be allowed to enter the hall. 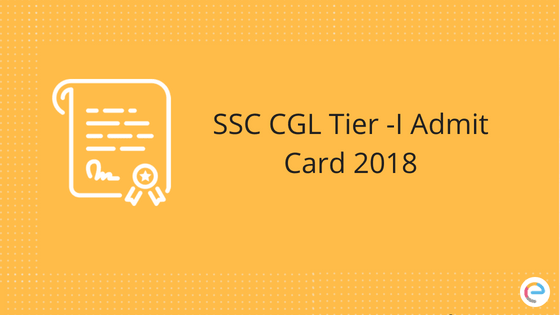 In this post, candidates can check out all details about SSC CGL Admit Card 2018. Students shouldn’t wait for the last day to download the SSC CGL Admit Card in order to avoid technical issues or rush problems in the last hours. Steps for downloading SSC CGL Admit Card is given below. Step 5 Click on e-admit card for SSC CGL. Step 8 SSC CGL Admit Card will be displayed on the screen. Step 9 Download the SSC CGL Admit Card and take a print out for future reference. If a candidate has lost their application form, they can download the SSC CGL Admit Card by entering Candidate Name, Father’s Name & Date of Birth. In case of any correction required on the Admit Card, candidates should report to SSC help desk. There are 4 sections in the Tier 1 exam of SSC Combined Graduate Level Examination 2018, with 100 questions which account for a total of 200 marks. Tier 2 too has 4 sections with 100 questions which account for a total of 200 marks. SSC CGL Tier 1 & Tier 2 exam will be conducted in online mode. Tier 3 is a descriptive exam and is conducted offline. Candidates need to write Essay/Letter/Application/Precis. Tier 4 of SSC CGL Exam 2018 comprises DEST/CPT these are required for certain government posts. The four tiers are indicated below. Candidates can download their SSC CGL Tier-I Exam Admit Card 2017-18 from the links provided above. We hope this detailed article on SSC CGL Admit Card helps you. For any query regarding SSC CGL Admit Card or the exam in general, feel free to drop a comment below and we will get back to you. CGL DIDN’T DOWNLOAD THE ADMIT CARD,pl take action. Cannot download the admit card. Please take action. i m not able to download admit card ..
has ssc cgl admit card been released?? Hey Ambica, please contact official authority. Hey, it’s not released yet. Hey, it’s not released yet. Keep an eye on the official website. r u able to download ur admit card? ssccgl admit card released or not new to ssc so i do no about it . pls help ? admit card released for tamil nadu? SSC CGL exam 2018 is delayed. Till now, the official date of releasing the admit card for the same is not announced yet. Please stay tuned, we will update the information as soon as the official notification comes out. SSC CGL 2018 is delayed, we will update the information about the admit card, as soon as the official notification gets released. For 2018, SSC CGL has been delayed. We will update the information, as soon as the information gets released by the official authority. The exam date has been postponed for 2018 and the official date is not released yet. We will update the dates as soon as it gets released. Hello Gurmukh, SSC CGL admit card for Himachal Pradesh (north-western region) will be released by 1st week of July. Please note that this date is tentative and this date may vary.